KILLINGTON—St.Patrick’s Day Friday, March 17, was truly a day to remember at Killington Resort. It was a sunny bluebird day with fantastic snow conditions after Storm Stella blessed us with 33 inches of snow. It also marked the day that Teresa Giblin became a first-time inductee into the 100 Day Club! 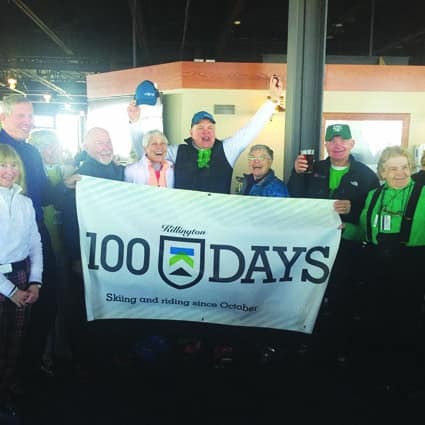 Teresa Giblin joined the club just 18 days after husband Paul celebrated his 81st birthday at the mountain and also his triumphant entry into the Killington 100 Ski Days Club. On St.Patrick’s Day Teresa was joined by Paul, many dear friends and some other 100 Day Club members to proudly present her with a 100 Day hat. Teresa and Paul Giblin are out skiing at Killingon with friends every chance they get. 100 Day Club members congratulate them both on this impressive achievement. 100 Day Club members welcome Teresa Giblin.